Farmrail System, Inc. is an employee-owned holding company for two Class III common-carrier railroads comprising "Western Oklahoma’s Regional Railroad." Farmrail Corporation (FMRC) has acted since 1981 as a lessee-operator for Oklahoma Department of Transportation, managing an 82-mile east-west line between Weatherford and Erick. An additional 89 miles, Westhom-Elmer, was purchased from the state in 2013 after 20 years of operation under lease. Another wholly owned affiliate, Grainbelt Corporation (GNBC), was formed in 1987 to purchase from Burlington Northern Railroad Company 178 miles of line linking Enid and Frederick. The parent company also has a joint-venture interest in New York’s Finger Lakes Railway Corp. (FGLK). A new motorist safety initiative sponsored by Oklahoma Department of Transportation is intended to reduce mishaps involving inattentive drivers at crossings without active warning or protective devices. All railroads operating in the state are to install reflective crossbucks and highway-type “yield” signs on steel break-away posts. Farmrail has 349 such locations, an average of one per route-mile. 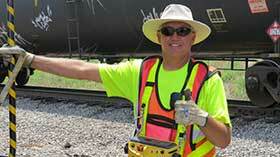 Farmrail is searching for newcomers with proven character, ability and attitude who really want to be railroaders. We need enthusiastic team players who spend their time productively, interact comfortably with co-workers, and perform effectively for our fans – the customers.